Designed and built specifically for well head treatment, AdEdge AD26 systems are engineered as stand-alone systems for the removal of iron, manganese, sulfide, and arsenic if it coexists with high levels of iron. 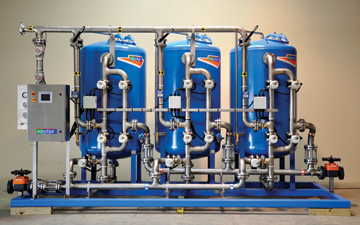 These systems are ideal for eliminating nuisance parameters and improving overall water quality. Our integrated oxidation and filtration technology utilizes a proprietary, highly active, NSF 61 Certified manganese dioxide media packaged in a pre-engineered, skid mounted treatment system for simple Installation and use. The targeted contaminants are co-precipitated and filtered in the media bed, which is periodically backwashed. Designed by AdEdge specifically for well head treatment, AD26 systems are engineered as stand-alone systems for the removal of iron, manganese, sulfide, and arsenic if it coexists with high levels of iron. Whether you need to comply with the secondary contaminant rule or simply want to improve the quality of your water, the AD26 system may be the best solution.